VALLEY OF FIRE STATE PARK, Nev. — Looking across the western horizon, red sandstone cliffs rise above the earth’s crust against a backdrop of sage brush, creosote bush and purple barrel cacti. When the sun hits the rocks just right in this Nevada state park, the entire 40,000 acre valley appears to be on fire. 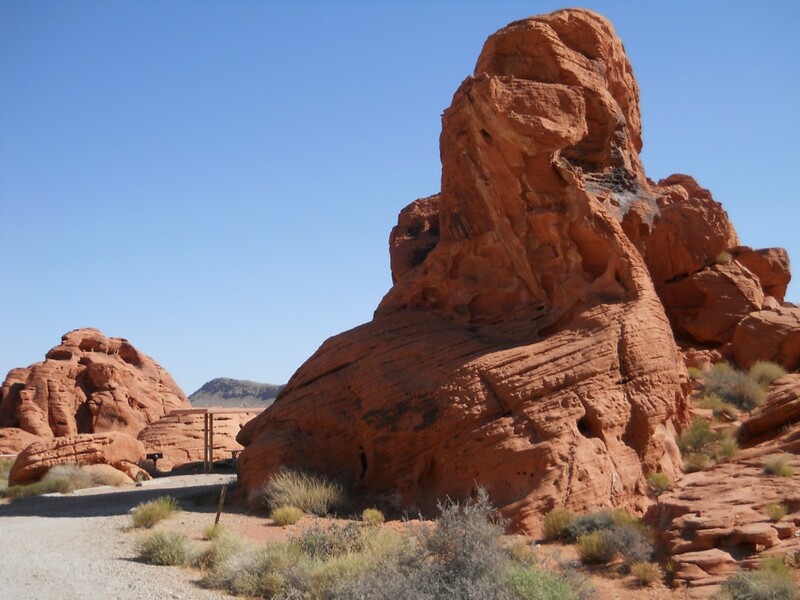 Just an hour southwest of St. George off the Interstate 15 Overton Exit, Valley of Fire is rich in geologic and historical significance and has many trails to conquer in a day. Located in the Mojave Desert, this Nevada Historical Marker was dedicated in 1935 as the first state park in Nevada. Theorized to have formed more than 150 million years ago during the Mesozoic era, red sandstone formations seem to envelop visitors with nature’s beauty and showcase incredible crevices and caves. 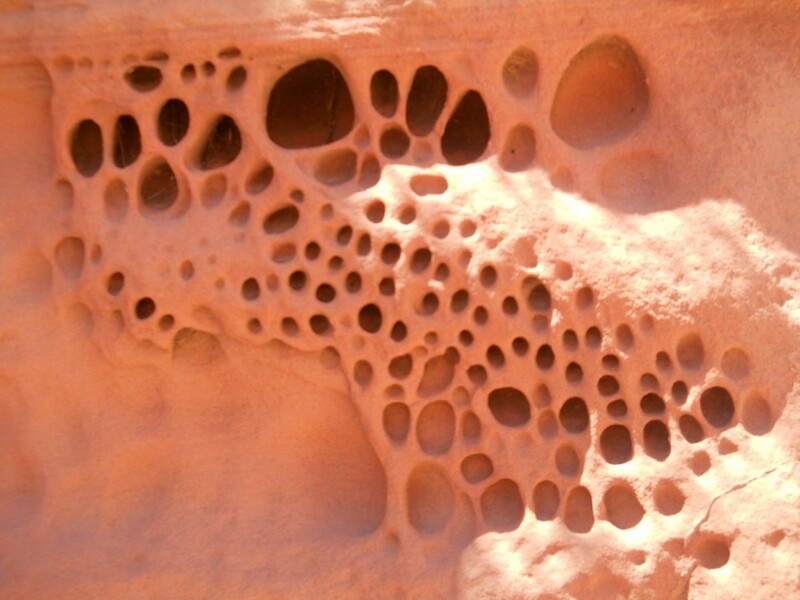 Erosion by rain and wind carved out crevices and pockets leaving sculpted impressions, some that appear as distorted faces staring down like a surreal Salvador Dali painting. 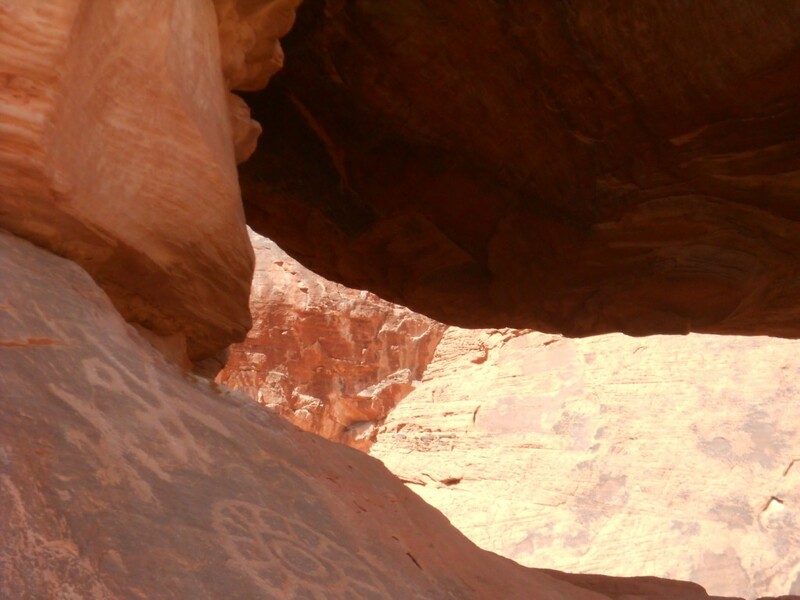 For those who love rock art, the best trails for viewing an array of petroglyphs are Atlatl rock and Mouse’s Tank trails. Mouse’s Tank leads the hiker along a sandy path, shadowed by the towering red cliffs, past a span of walls of southwest Anasazi petroglyphs etched into the dark desert varnish. At the beginning of the trailhead there is a sign that shows some interpretations of the petroglyphs, though the exact meanings still remains unknown. 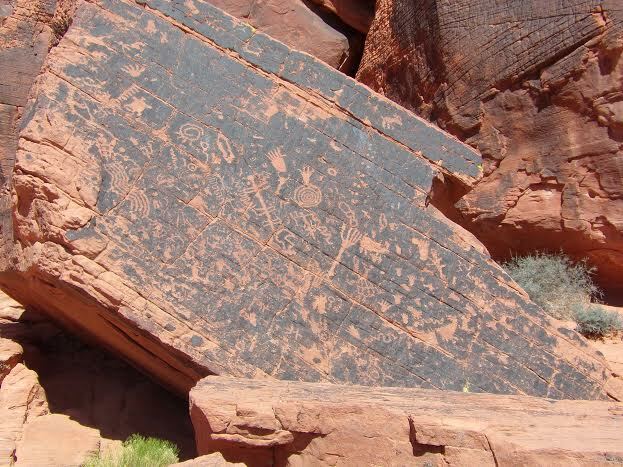 Valley of Fire’s outdoes other petroglyphs sites by the sheer quantity of inscriptions. If you are up for the trail less traveled — with amped up technical difficulty — Prospector’s Trail is the best choice. This 4.6-mile trail leads you on an unofficially marked trail (look for cairns, stacked rocks, to find your way) past staggering red sandstone cliffs. There are three points along this trail that are marked on the map as rock scrambles. A rock scramble requires you to shimmy yourself across or climb up and over undulate surfaces and boulders. Ropes are not required for rock scrambles as they are fairly shallow. You can follow Prospector’s Trail all the way to the White Domes loop, which showcases a conglomeration of multicolored, striped sandstone boulders. Yellow, pink and purple stripes pop against the white sandstone rock. 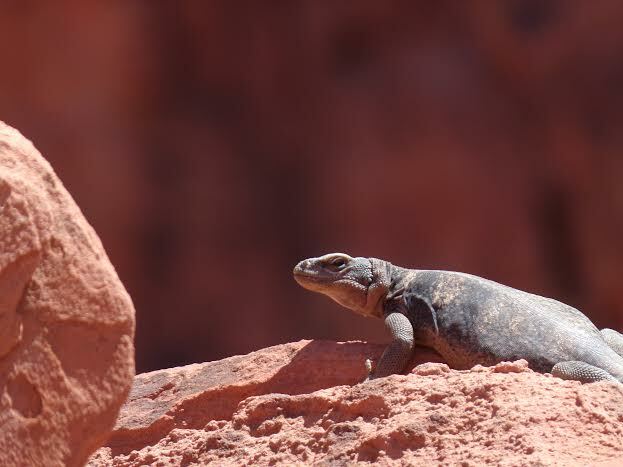 Be on the lookout for snakes, cottontails, jack rabbits, squirrels, chipmunks, coyotes and a variety of different species of lizards. 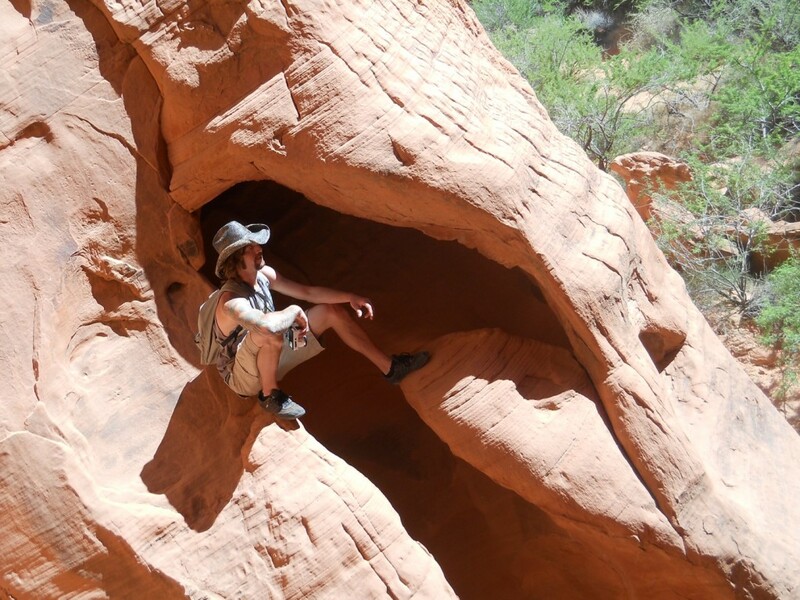 The best time of year to explore Valley of Fire is during springtime and fall. The Atlatl Campground offers 43 campground spots, many that are tucked up in the sandstone cliffs offering privacy and a more primitive feel. The fee is $20 per night, which includes the $10 entrance fee. Located in between Mesquite and Las Vegas off Interstate 15, there are two entrances: a west entrance from exit 75 toward Lake Mead/ Valley of Fire, and the east entrance from exit 93 toward Overton. 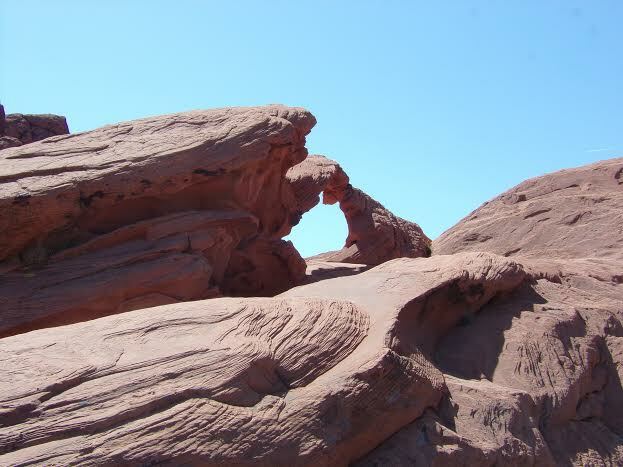 Both entrances connect at Valley of Fire Road. 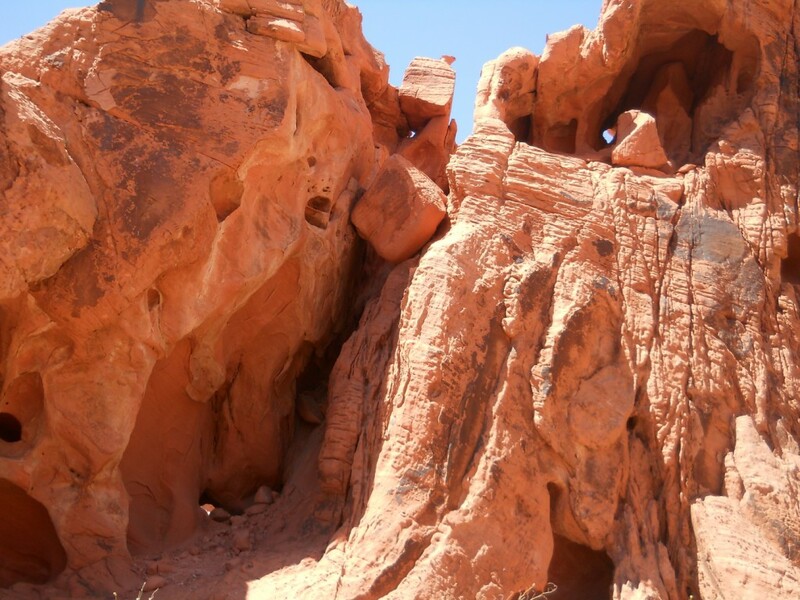 For more detailed information on Valley of Fire State Park please click here. http://www.valley-of-fire.com for more information! Nice article and photos. here are individuals who look after the obligations regarding lighting effects along with stanza. One incline which could initiative nevertheless has long been. exercising the main movement per se characterizes a very performing arts. If the light could purple, you’ll end waived in and might ignore the airport without having deeper evaluation. If the light is without a doubt grey, you will certainly be got out of group but also scrutinized. device you will want get got out of type.